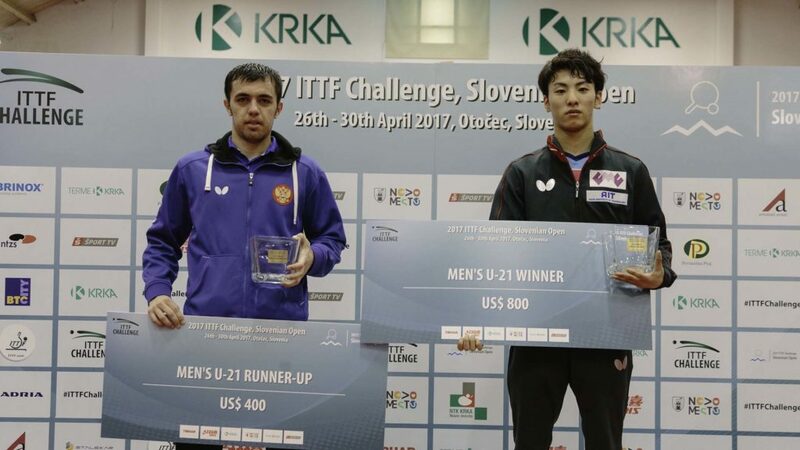 The winner in Belarus and Thailand, seeking a third such consecutive title on the ITTF Challenge Series; Japan’s Saki Shibata fell just one step short in Otocec on the afternoon of Saturday 29th April. Occupying the top seeded position in the Under 21 Women’s Singles event at the 2017 Slovenian Open, she was beaten the final by Adriana Diaz, the no.2 seed (11-13, 11-9, 11-6, 11-5) who, in so doing, claimed the first ever such title, male or female, for the Caribbean island of Puerto Rico. Defeat for Japan but there was success, in the counterpart Under 21 Men’s Singles final; not seeded, Yuki Matsuyama performed a quite remarkable recovery to beat Russia’s Sadi Ismailov in a full distance five match contest decided by the narrowest of margins (10-12, 10-12, 11-6, 11-3, 13-11). It was a first appearance in such a final for Adriana Diaz; for Saki Shibata, it was somewhat different. In addition to her efforts earlier this year in Belarus and Thailand, as well on this year’s Seamaster ITTF World Tour in Korea when losing in the final to colleague Minami Ando; on the 2016 ITTF World Tour she had won in Bulgaria but had experienced defeat in the title deciding contests in Belarus and in the Czech Republic. In Otocec, Adriana Diaz was a young lady with a mission; last year she had played Saki Shibata three times; she had lost in Belarus and Bulgaria but had won in the Czech Republic. In Otocec she levelled the score. Meanwhile, for Yuki Matsuyama, he upheld Japanese honour. Earlier this year in Belarus, Yuto Kizukuri had been beaten in the final by Romania’s Cristian Pletea but in Thailand Yuma Tsuboi had balanced the books. He had struck gold overcoming Chinese Taipei’s Sun Chia-Hung in the final. Success for Yuki Matsuyama in his first such appearance in an Under 21 Men’s Singles final but his second success against Sadi Ismailov; at the 2012 Polish Junior and Cadet Open, he had beaten Sadi Ismailov in the Junior Boys’ Team event. Defeat for Sadi Ismailov and defeat in his second Under 21 Men’s Singles final on the global scene; on the 2013 ITTF World Tour on home soil in Ekaterinburg, he had been beaten in the final by colleague, Vildan Gadiev. Once again, it was so near yet so far and if he is to achieve the goal then he must act fast; later this year in November he will celebrate his 21st birthday. Next year he will not be eligible for the age group. Meanwhile for Adriana Diaz, she has many more opportunities; in 2021 she will still be eligible for Under 21 events.